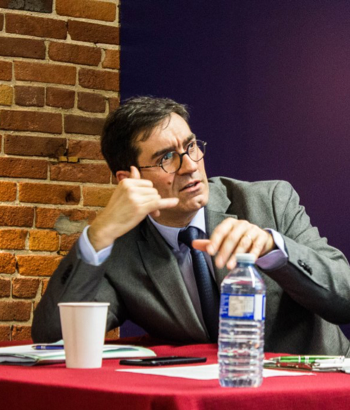 The Centre for Intellectual Property Policy (CIPP) along with its partners, the Centre for International Governance Innovation (CIGI) and the Stikeman Chair in Tax Law, are very proud to have hosted Innovation Week 2018 (Feb. 19-23), a weekly event comprising of several activities, including an intensive course, a number of conferences and roundtables with renown international experts (in total 25 speakers from 7 different countries). Ce fut à la fois un moment unique de diffusion du savoir ainsi qu’une occasion de nouer des liens entre chercheurs et praticiens. Asa Kling, former Director of the Israel Patent Office, lectured on international innovation and patent strategy as part of the Faculty of Law’s focus week. 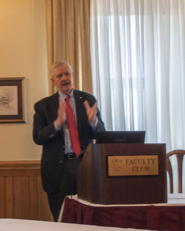 Asa Kling discussed the following topics: the different methods of measuring innovation, the relative value of different government incentives to encourage innovation, and the international treaties that regulate intellectual property. 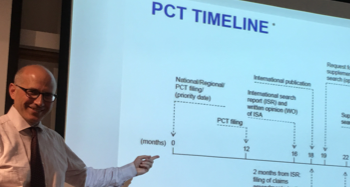 Asa Kling also discussed the differences between patent prosecution in different countries and the emerging bilateral and multilateral cooperation between national patent offices. 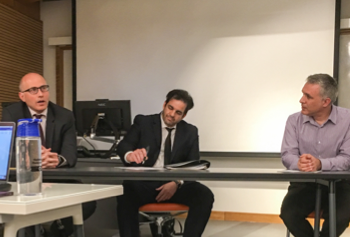 A roundtable discussion on this topic was also organized with Richard Gold and Konstantinos Georgaras, Director General, Corporate Strategies and Services, of the Canadian Intellectual Property Office (CIPO). In this session organized by the CRIEM (Centre de recherches interdisciplinaires en études montréalaises – dir. Pascal Brissette), Gorka Espiau, Stéphane Guidoin, Charles-Antoine Julien, Jean-Noél Landry, Pierre-Luc Bacon, Geneviève Boisjoly, and Vincent Thomas discussed the challenges and opportunities of Big Data and Open Data. They illustrated the debate on data governance and the rule of law and policy by providing examples of the use of big data in multiple areas, such as AI, smart cities, decision-making, computational sustainability, disability rights, accessibility, and transportation. Particular attention was given to accessibility, openness, collaboration, transparency, and citizens’ participation as guiding principles in advancing Big and Open Data as powerful tools to community actions. 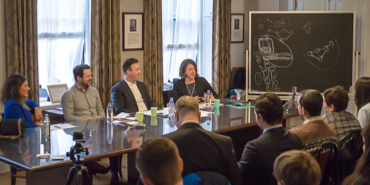 In this highly popular event, presented by Allison Christians, Max Jarvie, Marc Richardson Arnould, and Kendra Rossi gave an overview of the history, workings and future challenges relating to cryptocurrencies. Participants also discussed the various regulatory frameworks in different jurisdictions. 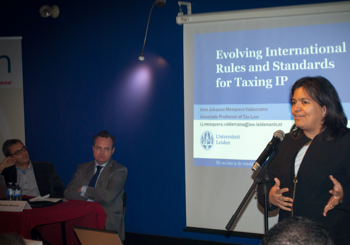 The patent box colloquium hosted by the CEIM (Centre d’entreprises et d’innovation de Montréal and co-organized by the Stikeman Chair was the opportunity for academics of different countries to discuss tax incentives for innovation, tax fairness as well as the OECD guidelines relating to patent boxes. The colloquium featured the following speakers: Nicolas Binctin,AlessandraFlamini, Asa Kling, Irma Mosquera, Lyne Latulippe, Alain Strowel, Edoardo Traversa, Jean-Pierre Vidal and Laurens van Apeldoorn. Trade policy has been at the forefront of recent political debates. 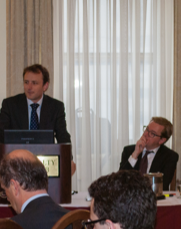 Renowned experts – Armand de Mestral, Marc Bungenberg,Charles-Emmanuel Côté,Henri Culot, Graeme Dinwoodie, Alain Strowel, Edoardo Traversa and Lukas Vanhonnaeker – discussed political and legal issues pertaining to CETA, Brexit, and the possibility of a transatlantic free-trade partnership. Le Centre remercie la Faculté de droit, nos invités, partenaires, ainsi que l’équipe du CIPP qui ont permis de faire de cette semaine une période stimulante et enrichissante. This content has been updated on May 5, 2018 at 12:57.